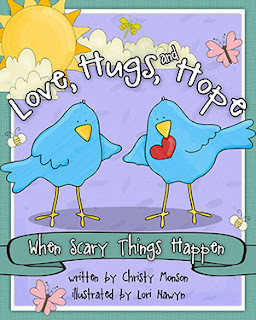 I really enjoyed this sweet children's book written by Christy Monson and illustrated by Lori Nawyn. Christy is a retired marriage and family therapist, and her expertise is evident in the way she simply and beautifully talks to children about how to work through their feelings "When Scary Things Happen". If you'd like to purchase this simple, yet very insightful book, you can find it at the below links. I'm excited to post this review about a new book by one of my favorite author friends: Christy Monson. This book really resonated with a lot of things that I've been thinking about right now. I enjoyed reading it, and it re-affirmed one of my long held beliefs (and one of the reasons that I love reading and writing so much): WORDS HAVE POWER! There you go. Whether they are spoken out loud to others, read off a page, or thought within our own minds, words have power. They have power to encourage and uplift. They also have power to discourage and destroy. Words have the power to bring people together or tear them apart. Words even have power to heal wounds, dry tears, and mend broken hearts. This message about the power of words seemed to be an underlying theme throughout Becoming Free. I loved how the author complemented her own stories and thoughts with inspiring quotes from Buddha, Helen Keller, Shakespeare, Benjamin Franklin, Amelia Earhart, Abraham Lincoln, Gandhi and many, many others. The author herself wrote many lines that are now on my list of favorite quotes. Just a few of these are: "Life happens to all of us. It's what you do with those happenings that makes you who you are." And "Depression is No Friend of Physical Exercise". I've read self-help books now and then, and I often walk away from them feeling either overwhelmed, bored, or simply uninspired. The way that Christy wrote about her own experiences from her career as a marriage and family therapist kept me engaged. As she combined those experiences with her assertion that the words we think about ourselves and the words we say to ourselves have a real impact on what we do and how act, she hooked me. Just a few of the areas of life she addresses are: work ethic, healing fear, decision making, allowing imperfection, and self-responsibility. 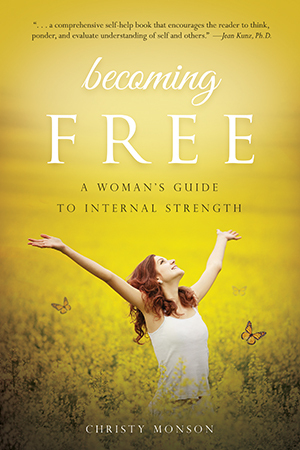 She offered real, practical exercises to help us re-train our inner dialogue, and she wrote of many things we can focus on in our life that will help uplift and free our minds and spirits. Some of these like gratitude, laughter, writing, service, and relying on a higher power have already blessed and strengthened my life. I found a lot of wisdom in this book, and I highly recommend it! If you are struggling in your life or with how you feel about yourself, this is a great place to start. If you're more like me and you feel good about your life and the direction you're going, but are always looking for ways to grow and learn and become a little better each day, this is also a wonderful resource! The author is hosting a rafflecopter giveaway which you can enter below.